This is just a quick note to let you know that our dear little Atlantic trooper, Happy Socks herself, is safe in Ireland. It is three months since I was picked up a few hundred miles north of the Azores by Federal Oshima ahead of Hurricane Joaquin, leaving Happy Socks behind. 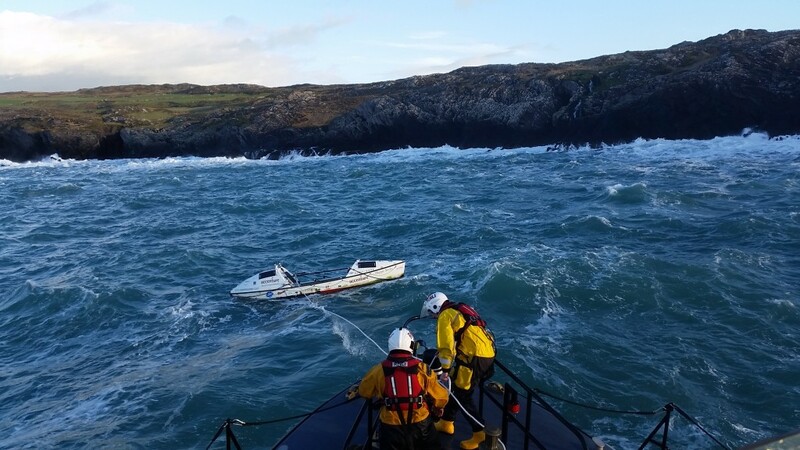 I nearly fell off my seat yesterday when I had an email letting me know that the Valentia CoastGuard had received a call about a boat that looked like it was in trouble and that the local RNLI crew at Castletownbere took her safely under tow to bring her to shore. If she had been spotted much later, she would probably have been smashed upon the rocks – she was less than half a mile from shore when she was picked up. We are making plans to go and retrieve her and shake the hands of the crew that picked her up, and give her a huge welcome home hug. To me, it feels like a friend has come back from the dead. It is very special and very emotional and I am very grateful. More in due course, but for now, I am busy book writing. Well, well, well. Happy Socks rides again! I really do wonder if this means a comeback for some of the rest of us creaking away in an unknown void. Such a great ending to your incredible adventure. I am so happy for you! I am sure your heart is singing. Ocean!!! happy day for happy socks! A part of you that was lost is now reunited with you. What a great way to start 2016—- and a new adventure!!! Hi Sarah, Such great news. It also means that Happy Socks went on to complete a large parts of the distance that you, personally, and for very good reasons, were unable to complete. Yay. Pity she couldn’t record her adventure for you!!! Given the knowledge of the weather and sea conditions that Happy Socks has been through, I think she will provide a very valuable structural record for further technical analysis and design suggestions. This is a very gratifying turn of fate. May I please also be allowed to suggest that that the return of Happy Socks (by virtue of her name) is also a testament to the enduring love and commitment of Sarah’s mother to her daughter. By the way, I assume not, but has anything been seen of Gulliver at all, since you had to leave him? Great news Sarah, what a start to the New Year, you are safe and now we know Happy Socks is to. She needs a medal too. Take care, we are looking forward to reading your adventure especially now we know that she will soon be home with you. An incredible journey. Wow! I am amazed at how much I miss you. Knowing you were out there, fighting for each and every kilometer, ….made my days energized & purposeful. Still….I am happiest knowing you are safe. Rock on, girl. Welcome to Ireland, Happy Socks! What a wonderful story – and having weathered a few storms here in Donegal over the last month or two we know something about what that little boat has been through! Congratulations Sarah. I look forward to seeing evidence of your ‘Happy Socks’ reunion. The team can now look forward to celebrating fully now that you have this great news. Even that book may now record this triumph over adversity. When you are all together it will be the happiest of reunions. I look forward to seeing photographs of Team Sarah together again. Take care amd good luck with the writing. Now, that IS a good omen ! HS will now be able to grace a few Boat Shows as part of the book, and lecture, promotion. May I borrow her for a trip around Glacier Bay AK???? Amazing, moving and definitely the best news of the week. Happy re-union and keep on writing. That’s great news with the safe arrival of Happy Socks. Pity that you were not on her but there has got to be a story about her safe arrival. Will she feature in your next venture. Looking forward to the book. Have you heard from the china man. So excited for you!! So excited for us that you are writing!! Cannot wait to buy your book!! Loved the last one. Wonderful news, will enjoy reading about this again in your book. WOW,,,, that is great ! So happy for you and Happy Socks ! Congratulations from Chatham, MA. So pleased that you and Happy Socks will soon be reunited! How wonderful that Happy Socks was able to complete the journey for you, from the pics she looks in really good shape? You will be able to get married on her now on Rutland Water. What of these suggestions that you will be able to use her on your next adventure – are you planning another one??? So looking forward to reading the book although it won’t be as tense as being on the journey with you via emails. The first thing I used to do ina morning was checking for your emails to make sure you were safe! Happy Socks will hopefully be with another happy rower before we get married, so no option of a floating gig. But yes, very happy to have her safely home. Congratulations on the recovery of Happy Socks. Certainly a big thanks must go to the RNLI from Castletownbere and the Valencia Coast Guard crews for doing what they always do so well. Fantastic news, she looks in good shape and had the determination to finish what she started….. Who does that remind you of? Delighted to hear the happy news! A great start indeed to 2016! Hope the writing is going well. It is indeed, thanks Jane. Slowly but surely creating a book now that the words are flowing. What a great surprise Sarah! I’m really happy for you. Great to hear from you again. I hope you and Viva La Vida are doing well on your side of the pond. I can understand that Happy Socks would feel like a cherished person to you. So glad you are getting her back. I predicted this would happen…one has to have faith. More adventures for you and Happy Socks, as she is a faithful friend. wonderful news Sarah. hope to see HS at a boat show when the book comes out. This is wonderful news ! Joy to you and Happy Socks…..YAY ! You must be bursting inside …. Good luck with the book Sarah – very sorry not to make your incredible London denoument. Very pleased to hear that ‘Happy Socks’ has now been trailered back home. She looks to be in good condition and surprisingly clean. I offer my congratulations to her designers and constructors. 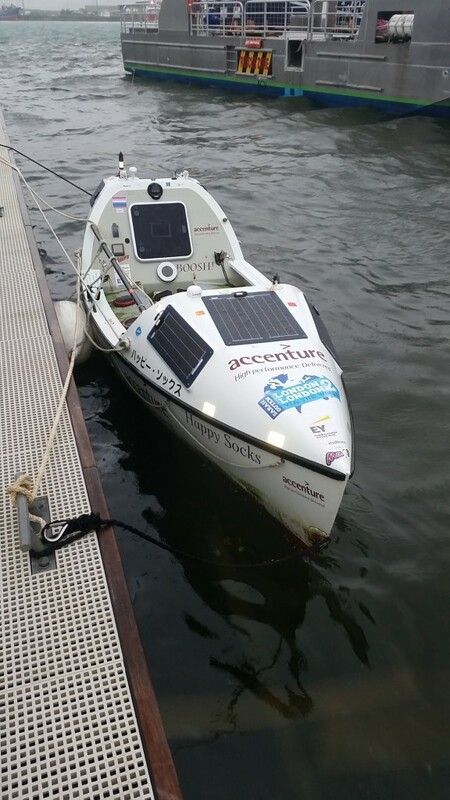 Her integrity is an unquestioned material encouragement to other ocean rowers. At one point Sarah you were thinking of rigging up a sail from used bags – you may remember my reference to the comment in ‘Das Boot’. May I suggest that once Happy Socks has been cleaned and inspected, this might be an exercise in research of value for someone on your team to undertake, and additionally a way to offer thanks for her good service? It was my dad who spotted your boat and alerted the Coastguard. He lives at Toor Pier just off the Mizen Head. Thanks for getting in touch and telling me this. Please pass on a huge thank you for me…and Happy Socks! I am very grateful to him and glad he has eagle eyes.